My neighbour turned 60 last week and she invited myself and my husband to her birthday party. So I decided to make her a card. 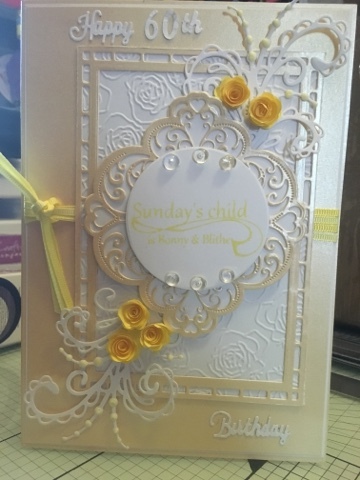 I decided to go into spring mode and used yellow pearlised card by crafters companion, I used a rose embossing folder in the die'sire range. Also the wor dies as well as the numbers. I used 2 different coloured yellow ribbon. I used dew drops from my old stash.